Ifthikar, 5 years old, carries his sister her Sfia, 2 years old in hope they can find some help. The generous response of CAFOD supporters across England and Wales to the plight of Pakistanis in the Khyber Pakhtunkhwa, Sindh, and Balochistan areas has enabled the organisation to deliver aid to 124,000 people. But there is still an enormous amount of work to do and CAFOD’s next phase of relief efforts will reach initially another 75,000 people in the coming months. and with it have gone the crops that feed communities and the local and nation economies. 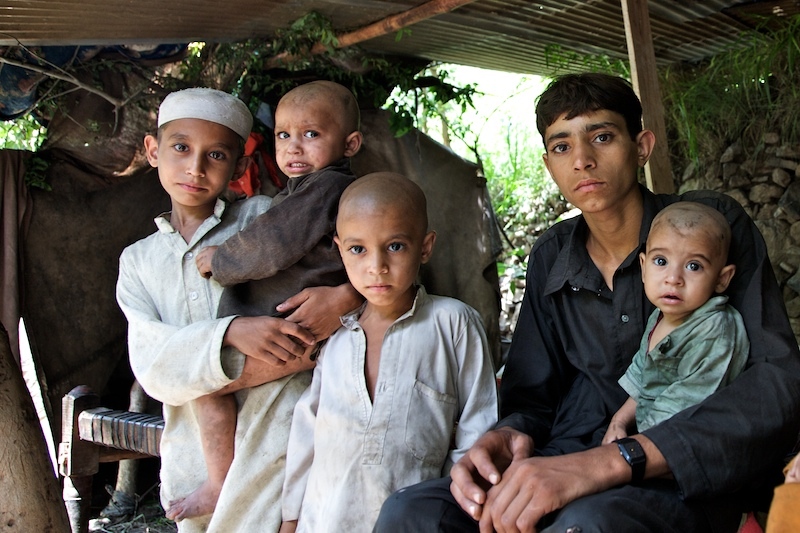 Sher Ali, 14 years old, sitting with his brothers in a temporary shelter he made after his house washed away due to flood. Using the money donated by supporters, CAFOD, with its partners on the ground in Pakistan, has delivered emergency and semi-permanent shelters, hygiene kits, blankets, food, safe water and health care. 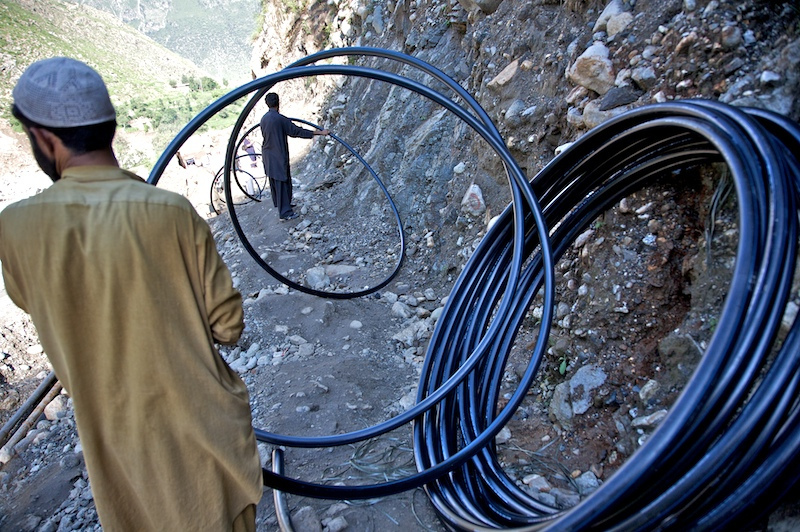 In the next phase of relief work, CAFOD will concentrate on access to clean water and rebuilding people’s livelihoods. Transitional shelters for almost 10,000 people in Sindh and Balochistan provinces. Working with partner CRS, this is one of the first shelter projects in the area. These shelters are being adapted by local communities to protect families from colder winter temperatures. With semi-permanent shelters, people can start concentrating on planting crops and rebuilding their lives and communities. Laying HDP pipe for drinking water on heavily landslide road between Bisham and Alpuri. From February 2011 CAFOD will be working to reach an additional 40,000 people by improving their access to clean water and by providing them with sanitation. Half of the families will also receive help to restart their livelihood activities by engaging in small-scale reconstruction schemes (e.g. irrigation canals or schools) or by providing them with seeds, tools and livestock that were lost in the floods. This work will be complemented by activities to improve wider local community capacity to respond to future disasters, reaching altogether around 75,000 people. At the end of July last year torrential monsoon rains inundated huge swathes of Pakistan leaving one fifth of the country under water. 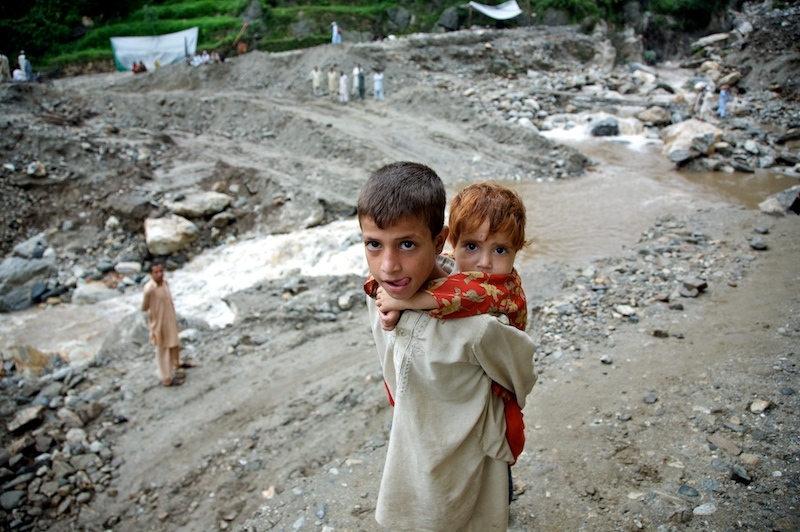 Almost 2,000 people were killed and more than 18 million were affected by the floods. This entry was posted in Emergencies, Fundraising and tagged advocacy, aid, aid work, CAFOD, CAFOD PLYMOUTH, Campaign, DEC, earthquake, emergencies, food, fund raising, Fundraising, Make your money count, News, Pakistan, Plymouth, Successes by CAFOD Plymouth. Bookmark the permalink.